There are sightings of the spirits of the season everywhere in our small town. 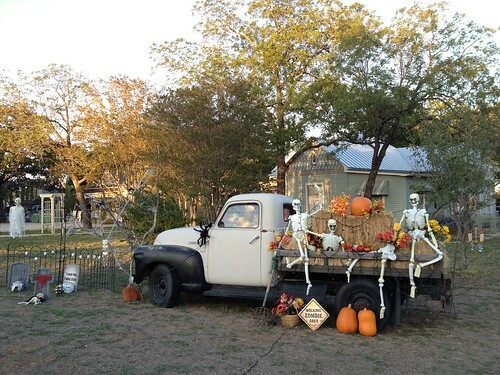 A walking tour of any neighborhood reveals just how creative and how extensive decorating for Halloween has become. I’ve been watching one home’s decorating progress all month. Every week something new is added to the already wonderful scene. I’m sure that house is a trick-or-treater’s delight! Christmas is still the season that features the most yard decor, but Halloween is a very close second. In fact, there are homes in my neighborhood that do waaaaay more decorating for Halloween than Christmas! Either way, that’s an ambitious effort compared to the few pumpkins and gourds on our porch this year. Personally, I’m glad there are those who take the time to be festive and share their creative talents for the rest of us to enjoy. It’s so easy to get caught up in the busyness of life, that we fail to appreciate the change of seasons or mark the cultural holidays that have always been a part of our lives. I like to think of them as mini-reminders to live in, and enjoy, the present. I love the Fall. I don’t like it getter colder, but I do like the way the air smells different and being able to take walks outside without melting. I also find the Fall is a wonderful time for reflection, maybe because my birthday is in the Fall and birthdays are always great opportunities to reflect. One of the thoughts that came out of this year’s birthday reflection is to get into the spirit of the seasons. I don’t want my participation in each season to be a rushed after-thought. I want to relish each season and squeeze enjoyment out of it. And this Fall? I’ve already sent off some Halloween treats for the granddaughters. I’m picking out yummy candy for our trick-or-treaters. I think I’ll bake spiced pumpkin cupcakes with buttercream frosting (gluten-free, of course) for us to have to keep up our door-opening strength on Halloween. I’ve been fixing some delicious comfort-food meals like apple and cranberry stuffed pork roast with farm-fresh green beans and, my sons’ favorite, meatloaf! And walks in the neighborhood before it gets too cold for me to even want to be outside. After all, seasonal spirits have already been sighted!